Let’s start by the beginning of the story, I had to reproduce a high frequency request/reply on a server to reproduce what is happening on an application having some trouble. For this I chose icmp as it is easy to simulate. Unfortunately ping flood is only available for root but as IBM may thing normal user should be able to overload an interface that have created the -l option allowing the same such violent method. Thank you IBM. echo "overall lost : $(( 1000 * $totlos / $totsend )) o/oo == $totlos / $totsend"
As the localhost is a good example as it always lost 39% of the traffic it is interesting to investigate that one. By running this command and the script in parallel it is easy to see that this counter is growing as we are losing icmp packets. So … we can assume faster is the response, quicker the input buffer is full. What is interesting is to consider that this buffer is about 61% of 100 icmp packet of 1024 … we can assume this buffer looks limited to 64KB. I assume this can be an issue when our application is trying to transfer large XML messages in mass over the loopback interface between internal services. This can also be seen by running netstat -D where the Idrops column is growing for IP Protocol in my case. The size of the received queue is defined by ipqmaxlen parameter. So the next step is to ask root to change this parameter to something higher ! But I found no parameters really interesting me at this point. Let’s take a look to the network stack to have a better understanding : the source of this picture is here. So according to the error counter (full socket receive buffer) and this schema, I would say that socket-receive buffer would be full the main issue for me here is that I’m running ICMP, not TCP/UDP… by the way, I will assume the mechanism are similar. This could confirm receive queue (on a lower level) is not in cause. As I’m reproducing the problem on loopback, these parameter have no limitation and should not be in cause. Let’s take a look to mbuf : these buffers are allocated to store the network data. They are pre-allocated buffers per CPU. So, only failed column is a good indicator of a mbuf memory issue. In my system, no failed. Apparently, according to some documentation network stack is using 256 and 4096 mbufs. Delayed mbuf could be a point to take into consideration, when performance issues are detected. Seems there is something to look at here, mostly as it is growing … but how to identify what is the source of this (no solution found)? 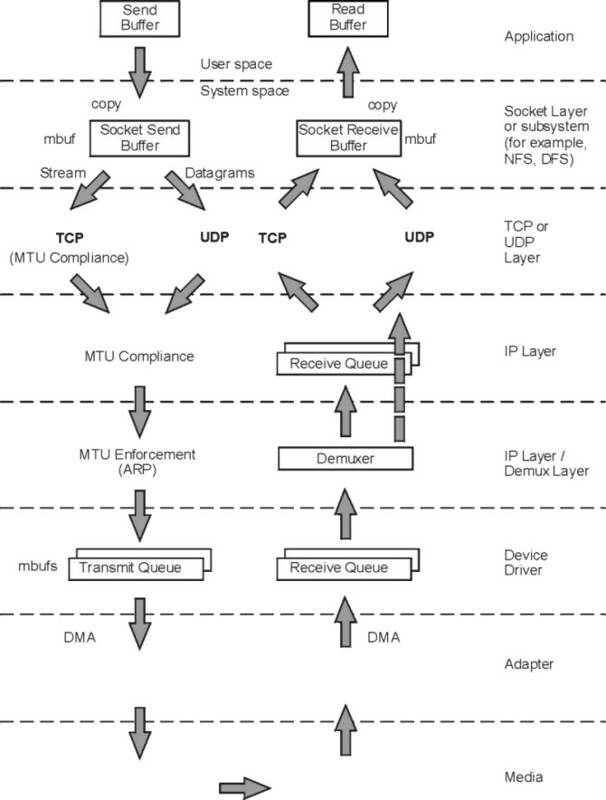 sb_max must be higher than tcp* + udp*. My problem is that ICMP is part of ? According to different test, I assume I’m having a drop occurring when the amount of data is about 64 – 74KB of data. This id lower than the limit here defined. In my system, 0 indicates, no specific limit. To go further, the use of the netpmon tool is really interesting to get a per process network usage analysis. This analysis is really interesting because there is a corellation between the network freeze seen and the growth of the delayed mbuf. My analysis is the following one : the frame is store in the IP stack and try to go up to TCP, for this a mbuf is required if the tcp stack have nomore mbuf available, I assume the IP layer put the frame in the parking and proceed the others (when smaller they can have mbuf available) what is strange is how many time the frame stay in parking, sometime 30 seconds in my case when in parallel lot of next frame are proceeded immediately. This entry was posted in Systems and tagged aix, drop, netstat, network, ping. Bookmark the permalink.